A snail has of course only one foot, so it is a real challenge to make a viable entrant. The mechanism used is different to natures; The snail uses a high speed battery powered gyroscope to generate vibrations which are then given 'direction' by angled bristles to move the snail forward. The life size walking hand (based on 'Thing' from the Addams family) is be powered by a glow plug model aircraft engine mounted in the wrist. The thumb and 4th finger are skids, and the middle three fingers reach out in sequence claw the hand forward. The life size walking hand can also swim whilst powered by a model aircraft CO2 engine mounted in the wrist. 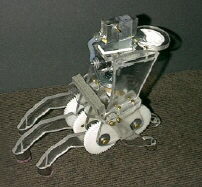 The same mechanism as the walker is used, and the middle three fingers reach out in sequence claw the hand forward with the extra large fingernails acting as paddles. 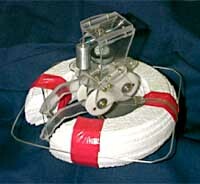 Flotation is achieved by the use of a miniature 'life belt'. 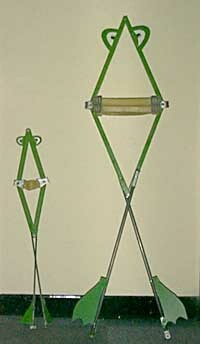 A heavy weight version of the 2001 bronze medal winning 'Wide Mouthed Frog' (on the left) was built to carry on the leaping tradition. .. it was deemed 'too dangerous' and banned from the competition.